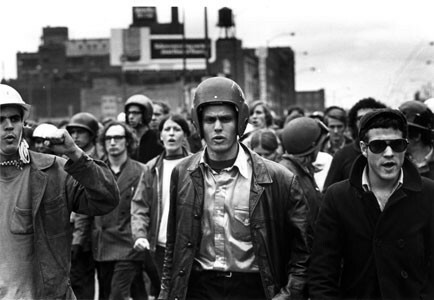 Paul Mattick Jr. takes a look at the 'New Left' and student movement at the end of the 1960s. The last six months of the sixties presented American radicals with an apparently incongrous pair of events: a massive revival of the anti-war movement and the disintegration of the organization which has for some time been justifiably identified with the "new left" itself, SDS. After a year or so of demonstrations in which growing militance of slogan was matched by decreasing numbers of participants, half a million people turned out in Washington in November to protest the war in Vietnam. An enormous part of this crowd was new to demonstrating. Significant also was the fact that, though still largely made up of students, it included larger numbers drawn from other social groups than ever before: white collar workers such as secretaries; young "professionals" (doctors and lawyers); high-schoolers; and GIs (as well as the stockbrokers and small businessmen worried about the threat to "American stability" posed by the continuing war). Notably absent as an organizational force was the SDS which existed before its June convention in Chicago. The Weathermen, Crazies, and Mad Dogs showed up to gather those desirous of physical "militance" for a brass-knuckled attack on imperialism, but the thousands who followed them to DuPont Circle did so more out of frustration with the flaccid atmosphere of Give Peace a Chance than out of support for Weathermen politics. WSA-SDS, which in October had by and large confined itself to pointing out the futility of the Moratorium and urging devotion to the true focus of struggle on trade union organizing on and off the campus, had to be forced to follow the "liberal" masses to Washington. This pair of phenomena may serve as an excellent symbol for the situation confronting what has thought of itself as the "new left." They bear witness, on the one hand, to the continuing destructive character of capitalism, represented most saliently by the adventures of American imperialism in Asia; and, on the other, to the failure of the new left to develop modes of thought and action capable of clarifying the way to a socialist society. The reborn peace movement does not represent a new stage in the development of American radicalism, but rather an enlargement of what existed before: mass "middle class" discontent with the war mobilized to exercise its constitutional rights of assembly and petition (and seemingly open to being channelled into dove electoral campaigns, thus providing a forum for leftish propagandizing and exhortation. At the same time, the failure of the left to respond in any inspiring way to this newly active discontent will not be usefully analyzed in terms of the evil work of the Progressive Labor Party or of the other political factions whose battleground SDS became until the fabric parted from the strain. An attempt to analyze our current possibilities and predicaments must be based on an understanding of the new left's context in a realistic appraisal of the social forces shaped by present day capitalist development. The "new left" (by which I mean the predominantly student movements focussing most forcefully on racism and war) has been a phenomenon of the sixties, beginning thus in a period hailed as one of prosperity for American (and world) capitalism. How is this to be explained? The underlying phenomena are hard to grasp; on the surface they are visible in the form of the permanence of racism and poverty in the "affluent" society, the necessity of imperialist war economy, and the increasing economic difficulties seen through the bourgeois economists' glass darkly as the dilemma of " high employment versus price stability." Postwar American prosperity might in fact be better characterized as pseudo-prosperity, from the point of view of the classical capitalist economy, while a fever of physical existence has been achieved for large enough numbers of the working class sufficient to maintain social equilibrium, this has been accomplished since the twenties only thanks to steadily increasing government interventions into the economy. Since capitalist "economic activity is immediately animated and guided, not by the quest of satisfactions, but by the quest of profits" (W.C. Mitchell), the prosperity of the post-Depression "mixed economy" represents not a true capitalist boom but rather a response to the inability of the economy to generate a rate of profit sufficiently high to make possible an accelerated rate of of accumulation. Because its role is played outside of, and in lieu of, the investment-profit-expanded investment cycle of the capitalist system, the expanding "public sector," while successful so far in maintaining social stability, cannot solve the essential problem of declining profitability. Indeed, it even accentuates it, as eventually the expansion of non-market, non-productive (of profit) production must inhibit the growth of a private sector growing at a slower rate, even while it is necessary if the private sector is to continue to exist at all. The results of what may well be described as a permanent crisis situation have been: stagnation in "growth," employment rates, and working class living standards; the "sacrifice" or minimal public support of unabsorbable elements of the population, such as the Appalachian poor whites and masses of the blacks; and attempts to extend and secure control over the Third World to allow for hoped-for economic development under American corporate auspices. If this is the general background, the reaction to the conditions thus described on the part of "middle class" students has been immediately due to particular changes in mode of life experienced by this part of the population in the course of capitalism's adjustment to its new conditions of existence. These are due both to the continuation of processes operative throughout the history of capitalist society and to the new features introduced with the mixed economy. Changes in technology (if not amounting to a "new industrial revolution") have resulted in a rising proportional importance of white collar labor at all levels of industry, from Research and Development to production. The same trend in employment has come from the increasing bureaucratization of industry made necessary by the advance of concentration and the attendant growth of capital units. The progress of concentration has continued also the process of elimination of the old petty bourgeoisie, in production and services alike, as multitudes of "independent" entrepreneurs or their sons come to find themselves in the position of wage-workers, in fact if not in principle (with the notable exceptions of the professions of medicine and law, which have so far successfully staved off their reorganization on industrial lines, although this too is changing.) The white collar sector of the working class expanded also with the growth of governmental bureaucracy and service officers following on the growth of the public sector. The reverse side of the simultaneous growth and relative deterioration of position of the white collar group has been the tremendous expansion of higher education (a continuation of the process whereby the Industrial Revolution first demanded quantities of uniformly skilled and therefore educated labor). This has affected the job aspect of the matter, as the enlargement of educational institutions to meet new needs obviously implies an increase in teaching and administrative personnel. But the more immediate impact on students came from the attendant reorganization and adaptation to new functions of the colleges. College is no longer merely a place for the acquisition of a "liberal education" and some necessary business skills for the young of the business elite, but has become largely a point of production of masses of the white collar labor needed by industry, government, and the school themselves, as even the "elite" universities have come to take on the character of the pioneer land grant colleges. The expansion of the college population and facilities made necessary the transformation of the institutions themselves from communities of young gentlemen and their mentors into bureaucratized structures, on the model of modern industry, processing huge numbers of students. At the same time the new needs of the economy which gave rise to the "multiversity" led to the addition to its educative functions of those of being service centers for both industry and government. The dominant ideology promulgated by the university remained that of neo-liberalism, the classical doctrine with some alterations covering the advance of Keynsian economic policies: free enterprise with equal opportunity and reasonable success for all; freedom within the law made by a pluralist-democratic government of, by, and for the people; the ability of the welfare state to mitigate all social problems on the road to their final solution. The conflict between these values and the realities of modern capitalist society could only grow increasingly apparent to students, given by their very position of privilege an opportunity for some degree of critical examination of a world in which their future positions increasingly took on the character of a set of equally unsatisfying "slots" - especially when these realities included the likelihood of nuclear annihilation. Thus openly leftish political life returned to America with the largely student anti-bomb movement, reaching its first peak in the Washington demonstrations of 1961 which involved some 7000 people. The threat of future destruction quickly proved to be but the tip of an iceburg of daily catastrophe, with the "discovery" of poverty and the spotlight cast on racism by the rising activity of the civil rights movement. Here, too, students became deeply involved. SNCC was born out of the contradiction between the rising aspirations of black college students and the realities of the black man's position, in the context of the struggles led in the industrializing south so dramatically by Martin Luther King, Jr. Hundreds of "white liberal" students answer to call to join the attempt at (electoral) political organization of the blacks. The failure of "the Movement," due to the essential powerlessness of its rural base, progressively driven from a buyers' market for agricultural labor into urban employment, was experienced by the young organizers primarily in terms of the brutality of living conditions of the people they had come to aid, the clear demonstration of the class bias of governmental authority, and the total abdication of that bastion of liberalism, the Democratic Party, to the strength of the Dixiecrats. The "end of ideology" was shattered beyond repair; or, more accurately, exposed as the triumph of ideology the concept had in fact represented. The new consciousness was indeed ambiguous, as rational responses to real social conditions were for the new left activists not transparent but only felt as such through the shroud of the liberal ideology. "The ideas of the ruling class are, in every age, the ruling ideas;" they can be replaced by a true appreciation of social affairs only to the extent that class rule is challenged by a social force embodying the principle of a classless society. As we shall see, it is precisely the absence of such a force which has limited the ability of the new left to escape from the ideological spectacles of bourgeois society, and thus to see a way towards socialist revolution. It will not be necessary here to trace the development of the new left in any detail, but only to pick out the main trends. Despite the fact that it has been primarily a student movement, the new left has by and large focussed its critique not so much on university life, its immediate social environment, as on capitalist society in general. The connection between the two has been made mostly in terms of the university's direct services to capitalism, rather than its general role in society and the internal consequences thereof. This has been both a strength and a weakness of the student movement. It has allowed for the elaboration of a critique of the society, of issues which do not confront the students in their daily activity but which were not raised outside this context; it has also obscured the nature of the revolution which the new left has come to see is necessary and, thus, their potential part in it. In part this characteristic of the student left has been due to the peculiar position of students, who are not involved in the production process but are only in training for it. It is not without significance that student left activity has so far largely centered in the elite colleges, rather than in the junior and "community" institutions into which working class youth is channelled. For the latter, college represents a way out of factory labor and Dad's store to white collar and administrative jobs; whereas for "elite" students, the end of college represents not entrance into a better life but the ending of a freedom and enjoyment that has been theirs from birth. [Footnote: Interpreting the student left as a "middle class" refusal of its new proletarian status suggests a link with the hippy phenomenon. In the latter case, however, the refusal of proletarianism takes the form not of a demand for social change but of a simple rejection of the status quo. The practical impossibility of the latter response spells either attempted retreat into pre-capitalist lifeways, by moving to backward countries abroad or to the woods at home; insanity or death; or integration into capitalism in a way psychologically more acceptable. This has meant either the elaboration of a life of private sensibility in hours off from a "straight" job, or a sort of neo-petty bourgeois artisan/shopkeeper existence. To say this is not to criticize (e.g., as "petty bourgeois individualism") the use made by young people, in all classes, of the "youth culture" to express their budding rejection of work discipline, wealth/status goals, the concept of "career," and authoritarianism in general.] It is also precisely the privileged status of these students that allows for a moral rejection of the power positions open to at least some of them; thus the rejection of working class life is joined by the reactivation of the liberal conscience. It was with this, then, that the new left began, rather than with a conscious response to its own immediate situation. It was in the name of (bourgeois) humanity that the anti-bomb and civil rights movements developed. In the beginning, the social destruction wrought by capitalism was still seen in terms of "problems" to be solved to fulfill the promises - liberty, equality, fraternity - of the bourgeois revolution of the eighteenth century; the element of radicalism consisted largely in a readiness to work outside of more conventional political channels, although an ambivalent attitude towards the possibility of worthwhile work with the Democratic party survived in SDS until 1965. Then, as the experiences of participants in the movements mentioned led to a growing awareness of the nature of capitalism, the new left's politics remained largely those of involvement in movements of the "disadvantaged" - the blacks, the poor, (most recently) the workers. Throughout, the student radical saw his role not in terms of his actual social position but as that of a force, so to speak, outside of society, organizing those inside on their own behalf. There is one major open [footnote: I leave out a class of quasi-exceptions: the many "black studies" movements, adaptations of the "black power" concept to the campus, which raise special problems for analysis.] exception to the pattern of the new left focus outside the university: the Berkeley revolt of 1964. Even here the seed came from involvement in the civil rights movement: The demand for free speech was raised by activists forbidden by the university administration to hand out their leaflets on campus. Yet, as Mario Savio put it, while the struggle for civil rights provided a "reservoir of outrage at the wrongs done to other people ... such action usually masks the venting, by a more acceptable channel, of outrage at the wrongs done to oneself." To the extent that the Free Speech Movement quickly involved masses of students it expressed not so much the political preoccupations of the radicals as general student dissatisfaction with the nature of the "multiversity." Indeed, this applies too to all those campus revolts which attained numerical importance; though generally the radicals have succeeded in maintaining their demands as the apparent focus of activity. Berkeley is thus an exception that proved the rule of student radicals' rejection of university issues as objects of concentrated effort. University reform has remained the purlieu of those whom the radicals derogate as liberals and in fact has generally remained a realm of committees and other forms of cooptation. Even in the brief period of the "student syndicalism" strategy in SDS, campaigning for student power was thought of largely as a tactic for getting students involved in confrontations with school and state authorities, which were expected to lead to student radicalization and transformation into movement activists. Comparison with the European student left is interesting. In Germany, France, Italy, and quite recently in England, movements have developed in confrontation with the university institution directly. This was furthest developed in Germany, with a range of activities from the creation of the "critical university," a well organized attempt to work out a critique of and alternative to the content of bourgeois education, to an attack on the forms of educational practice and structures of student life. The same sort of thing developed to varying degrees, in France and in Italy. At the same time, these movements never lost sight of the wider social context of student dissatisfaction, both in theory and agitation and in practice, so that the student mass base has become easily involved in working class action. Of course, the dilemma thought to exist by some US radicals, between concentration on "student power" and "class politics," poses no problem, because the university crisis is part and parcel of the general social crisis of capitalism. Thus the great moments of the French and Italian student movement were contained in mass strike movements; and indeed the relative fragmentation and powerlessness that has marked the French student left in the past year is a reflection of the low level to which the general class struggle has fallen back since May, 1968. The dilemma thought to exist by some US radicals between "student power" and "class politics" poses no problem, because the university crisis is part and parcel of the general social crisis of capitalism. The great moments of the French and Italian student movement were contained in mass strikes.